Whilst there has never been any plans for a sequel to Shadows of a Stranger, the writer has instead come up with a novel that features some of the Shadows characters in cameos. Broken Melody was released just last month and is set in the same story-world of Meridian, with some of the film locations also featuring and being explored in greater and more intriguing depth. 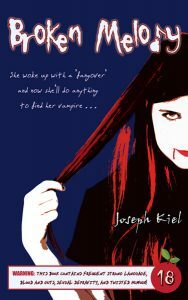 The story is about a young and carefree student called Melody who wakes up one morning with a ‘fangover’ and must go on a frantic and twisted journey to find the vampire who infected her before she too will turn into a blood-sucking creature of the night. There’s a definite shift in tone with this story, with a lot of twisted and adult humour, not to mention the introduction of supernatural creatures to Meridian! The book is available on Amazon in eBook and paperback form. Please do check it out and also stay tuned for some further Shadows-related releases in the near future!